He is involved in civil engineering and transport, environmental and land-use sciences, geographical IT systems, statistics, economics, strategy and planning, information technology and management. He graduated with a master’s degree with honours in Civil Engineering at the University of Firenze and a PhD in Transportation at the University of Pisa. He also trained at the University of Strathclyde (UK), College of Europe (Belgium), and some other technical and management schools. 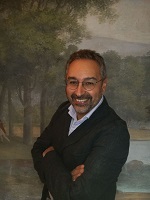 Currently strategy manager for the Ferrovie dello Stato Italian railway company, in the past he also performed teaching and scientific advisory and research activities for various universities and institutions. He has been contributing to LaGeS teaching and research activities since 2011. He is the author of around 30 scientific papers in transport engineering and social, economic and environmental sciences published in Italian and international scientific journals. These include: “A new information system for predicting sector-based and land-based socio-economic variables” (with Dallara A., Radicioni M., De Angelis F. e Guerrizio M.A., AISRe 2010), and “Modelling the Micrometro transport system for the city of Firenze” (with Brandani V., Basta M., Fallani G.,Sassoli P., Polistampa 2004).